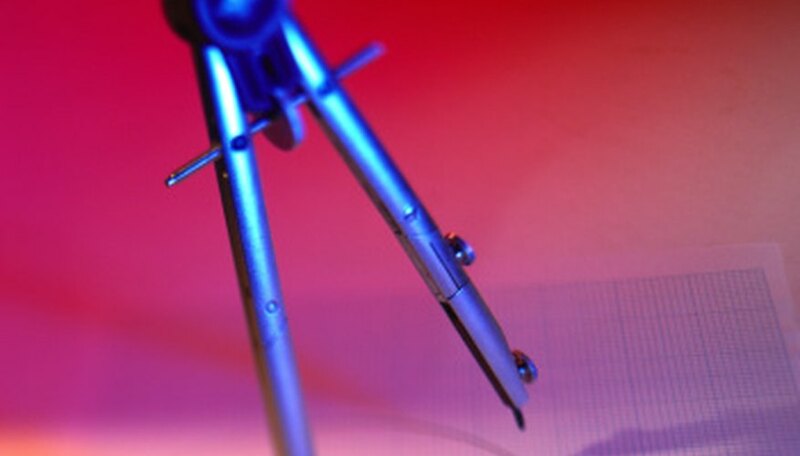 A compass is a tool that uses one stationary and one mobile point to draw symmetrical objects. A compass can help you draw a perfect circle and you can also use it to create one or multiple rectangles. A drawing compass allows you to attach a writing tool on the mobile point of the compass. Always use a pencil in case you need to go back and re-work any of your drawn shapes. Use a compass to draw a perfect circle on a piece of paper with a pencil. One point of the compass remains stationary as you draw a circle around that point with the other end of the compass that holds the pencil. Draw a line through the circle by placing the straight edge on the center point of the circle and drawing a straight line that cuts through the circle and crosses the circle's perimeter on opposing ends. Draw a perpendicular line to the center line which runs from the center of the circle to a point on the perimeter of the circle. This will show you the point on the perimeter of the circle that you will use to draw a line that is parallel to the center line and will form your rectangle. Draw a parallel line to the center line by placing a straight edge on the perimeter point where your perpendicular line ends on the circle. Connect the ends of the parallel lines to one another on equal angles to complete the rectangle. Use your compass to make the rectangle larger by using one corner of the rectangle to place one point of the compass, and use the other point to draw an arch down from the opposite angle of the rectangle.